THE SKINNY: Yes, this night moisturizer is blue. And it kind of tingles like you would expect a blue cream to do. Overall, I really do like this night cream. I would have rated it higher, but the price is pretty astronomical for what it is. Ostomtics uses something called "copper technology," or a synthetic skin-conditioning agent, to help moisture and heal skin. Plus, there's a bunch of vitamins and antioxidants. This cream is slightly cooling against the skin. It doesn't bother eyes. And my skin does feel a little tighter after use. KEEP OR TOSS: Keep. I will use this sample sparingly until it's gone. 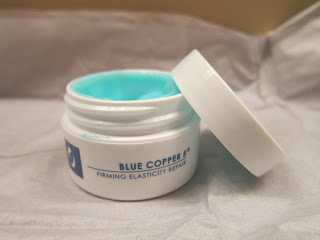 CHECK IT OUT: Use this product after washing your face each night. Find instructions, ingredients and details at the Osmotics website.